So let's see how can one integrate Botsify's website chatbot into his/her WordPress site or Blog. Create a chatbot in Botsify, follow our other tutorials, to learn how to quickly create a chatbot of your own. Remember, you have to create the website chatbot, for it to be link-able with any website, including WordPress. You have the option to either copy the Iframe based or the non Iframe based web widget code. 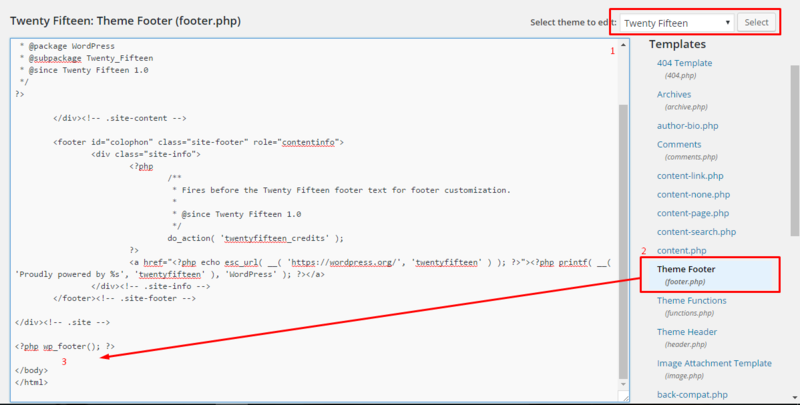 Now login to Admin Panel of your WordPress site, and go to "Appearance -> Editor" This will open up some code like in the screenshot below. Select you current theme from the drop-down, and then click on the footer.php. Find the closing body tags (</body>) in the file, as in the screenshot below. That's it, now paste the code you copied from the step # 2 into this area before </body>. Click save to see changes in your site. Remember, your website chatbot is integrated with your theme, therefore if you change the theme you will have to redo the same process with your new theme.